Google has shared this month's look at how many users are accessing the Play Store using which versions of Android. The numbers probably won't surprise you. Marshmallow still sits at a low 4.6%. Lollipop's numbers have barely budged in either direction. Except, as small a slice as Marshmallow may have, it's twice as large as it was last month. This is also the largest jump since Android 6.0 first launched. 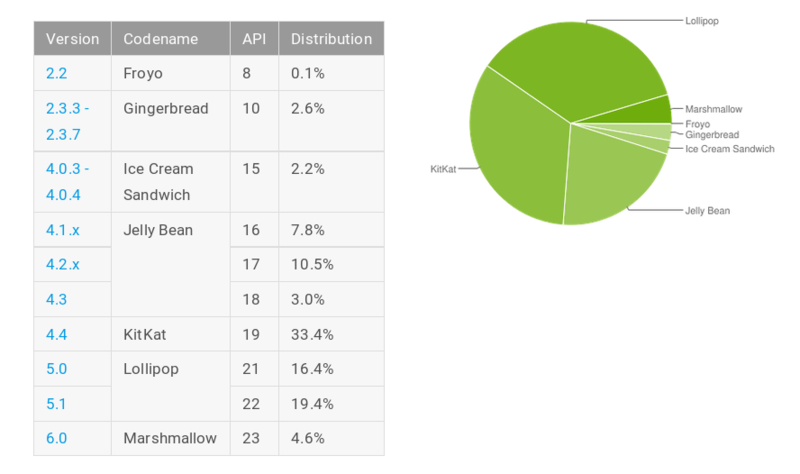 Over half of Play Store users are running KitKat or higher, with Android 4.4 dipping a single percent point down to 33.4%. Each version of Jelly Bean saw an ever so slightly drop in users. Older releases have virtually held constant. Those Froyo phones could disappear any day now, but they don't seem to be in any rush. As for those Gingerbread phones, they may still be around in 2020.